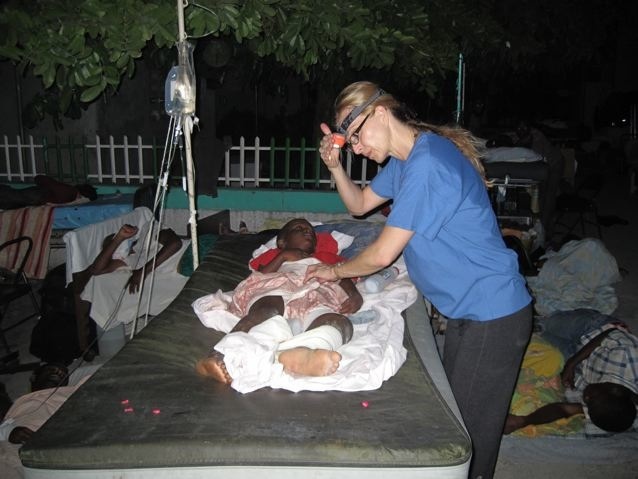 Four days after a 7.0 earthquake hit the small country of Haiti, nurse anesthetist Debra Hawk was preparing for one of the first operations performed in the country since the devastation. A young Haitian woman was laid out before her on a makeshift operating table, her leg crushed and mutilated from the weight of a crumbled building. Hawk’s medical team knew an amputation was necessary to save the woman’s life. They also knew that a lack of water, disinfectant, electricity, and proper supplies would make the operation dangerous. Hawk found a hack saw in the rubble to sever the woman’s mangled leg with. The same saw would be used to remove roughly 100 other limbs over the course of the following week. This was the reality in which Hawk found herself only a day after leaving the comforts of her Manhattan Beach home. Hawk has been an anesthetist for the past 18 years. She had just ended her work day when the call came the night after the Jan. 12 quake. 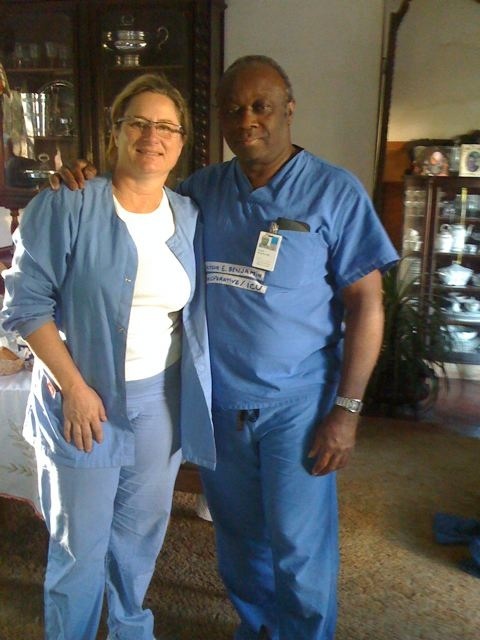 Massachusetts-based orthopedic surgeon Dr. Pier Boutin, with whom Hawk had formerly worked at a hospital in Ft. Lauderdale, was putting together a medical team that included a handful of orthopedic surgeons and critical care doctors to go to Port au Prince. The team still needed anesthetic support. After receiving flight clearance through Secretary of State Hilary Clinton, the team took off for the small, devastated country with basic supplies, such as IV start kits, anesthetic, gowns, gloves, and orthopedic drills and saws — “as much as we could pack,” Hawk said. The severity of the situation became real before the plane ever touched down. The one remaining functional runway at the country’s only airport was unlit. A hovering helicopter served as a makeshift control tower. The team circled in the air for two hours looking down at a darkened city. Three days had passed since the earthquake by the time the team’s plane touched down. Not one victim had undergone surgery. The death toll had already reached 140,000. Over 300,000 Haitian citizens were without homes, according to Hawk. Nearly every federal and military building had been destroyed. As the team’s minute-by-minute plan evolved, they discussed their options for finding a facility at which they could work. They settled on Port au Prince General Hospital, a 700-bed building that served as the main medical facility for the entire country. Hawk arrived to a heart-wrenching scene. Only three of the hospital’s 14 buildings stood. Hawk learned that 150 nursing students were buried underneath the rubble of one of the collapsed buildings. 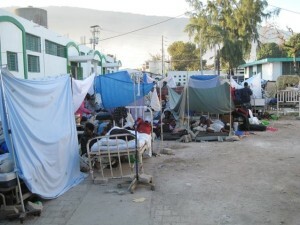 Hundreds of moaning, injured Haitians packed the streets surrounding the hospital, with no sign of local government officials or medical personnel. Many of them were injured, killed, or trying to pull their own family members out from under the city’s debris. The stench of infection and death lingered in the sweltering heat, kicked up every now and then by a gentle breeze. Hawk watched dump trucks pick up dozens of bodies for transport to mass graves. The team quickly realized that before they could begin saving lives, they’d have to recreate the hospital. Hawk and another nurse began scouting out the hospital’s buildings. The ones still standing were filthy and in complete disarray. Despite a lack of cleaning supplies and running water, the pair cleaned up one of the rooms and converted it into a makeshift operating suite. Meanwhile, Dr. Boutin and her father Dr. George Boutin, also an orthopedic surgeon, treated patients in the parking lot. There was no gas or clean water, let alone essential medical equipment, such as oxygen tanks and anesthetic machines. The orthopedic drills and saws they brought were worthless. They required electricity. Among the rubble, Hawk found one bed and a stretcher that became an operating table. She also uncovered a much-needed oxygen tank and the hacksaw that would be used for amputations. The doctors used vodka to sterilize tools, and headlamps — like the ones used for cave expeditions — for lighting. It was a start. The team began operating. “When you go in, you think, ‘I can’t work like this. But you have to. You have no choice,” Hawk said. By the next day, medical teams from around the world arrived with supplies. The makeshift hospital grew to five operating stations. Areas became specialized. One of the team’s doctors set up a hospital infrastructure that included triage, pediatric and critical care units. 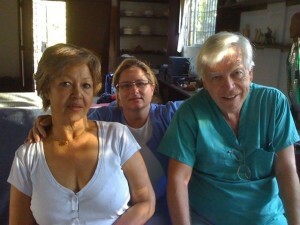 Another served as a recovery doctor for post-op patients. Hawk served as the head anesthesiologist. Hawk assisted in a minimum of 10 surgeries a day — all amputations – over the next several days. She worked until 11 p.m. each night. The streets surrounding the hospital were no longer strewn with injured people and there was a high survival rate among the patients they treated. Things were starting to look up. Then on the morning of the sixth day, a 6.0 aftershock hit. The hospital reverted to the state it had been in when Hawk first arrived. Terrified patients fled to the streets, taking most of the precious medical supplies and beds with them. Leg amputees hopped out of the building. The team walked the grounds in search of their supplies. By mid-morning, most had been recovered and the medical teams began the laborious task of once again setting up the hospital and moving patients indoors. “We picked right back up and moved forward,” Hawk said. From what she saw, so did the Haitians. Despite the chaos and seemingly insurmountable odds, Hawk described them as being calmly resigned. Tent cities and impromptu marketplaces were erected on side of the road. When a medical team from the Mt. Sinai Hospital in New York arrived that day with 60 health professionals and more supplies, the team felt that they could hand off the hospital and return to their jobs back in the States. They had been in Haiti for seven days. Today, international and local Haitian health professionals continue to treat patients at the makeshift hospital Hawk’s team started. Hawk fears the tiny, impoverished nation will never be the same. Hawk sits in a plush, stylish chair at Manhattan Beach’s upscale Shade Hotel on a beautiful Saturday afternoon in late January, recounting the events that took place just a week before. As well-dressed patrons pass in an out of the hotel lobby, she flips through the 1,200 photos from Haiti she has saved on her laptop. The juxtaposition is jarring. Hawk and her 13-year-old son, Jaeden, crouch in front of the computer, so as not to offend anyone with graphic pictures of mounds of broken, mutilated bodies and orphaned children bleeding in the streets. No doubt Jaeden has heard the story before, but he listens intently, reflecting on the enormity of the situation.